Being on a budget means that we often need to get creative in the kitchen. Playing our own version of the TV show “Chopped” is one way we challenge ourselves to create a meal out of the ingredients we have. It limits the amount of food that goes to waste, saves us time by not having to run to the store keeps money in our pockets, and when the recipe turns out, can be a lot of fun. I have a slight obsession with quinoa, and without fail we always have quinoa in the cupboard, and a surplus of produce in the fridge. Toss the two together and you have the perfect, and healthy, salad. 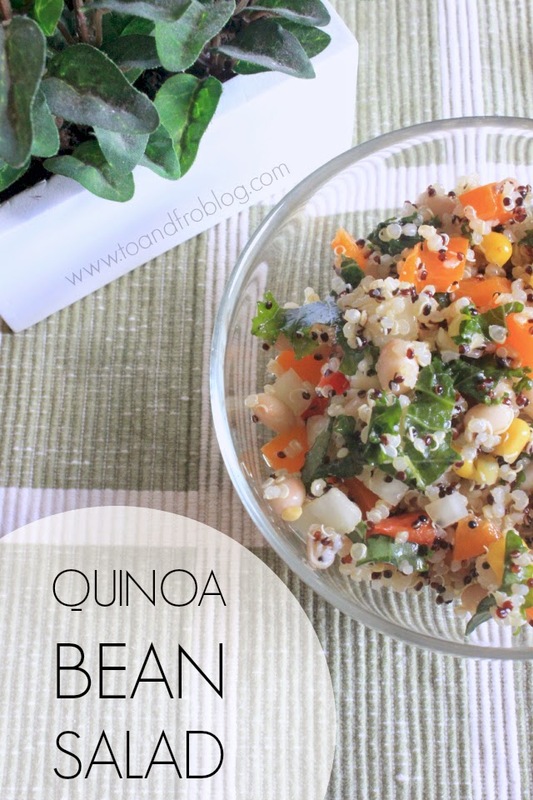 So, whether you are looking for a new lunch idea, or perhaps a side dish for dinner, this quinoa and bean salad provides a complete protein that will fill you up. Directions + Bring two cups of water to a boil. Add quinoa and turn heat to low. Cook covered for 12-15 minutes. + Remove from heat and fluff with fork. Allow to sit covered for an additional 5 minutes. + While quinoa is cooking, chop vegetables. + Make the dressing by whisking all dressing ingredients. + Mix the cooked quinoa with other salad ingredients and dressing. Season with salt and pepper to taste. + This salad is equally good cold or warm. Keep leftovers refrigerated. yum! I love making this type of salad. I always add a little avocado to it as well!